This is what all Volunteer Visitors do - Bring Jesus’ Healing, whether spiritual or emotional, to patients in hospital and residents of long term care centres. By offering a listening ear and compassionate shoulder and sharing the gift of prayer and Scripture, visitors invite Jesus into each individual's situation. Spiritual and emotional healing can assist in physical healing. 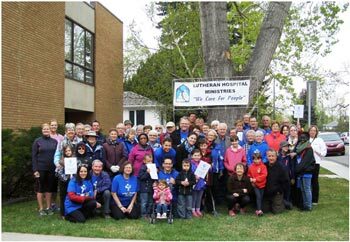 Lutheran Hospital Ministries Southern Alberta needs your help. We need more trained Visitors. If you feel moved to become a Volunteer Visitor, please contact us for information on the next training session. We depend on our dedicated Visitors who give generously of their time and talents. We also depend on the support of the Walkers who support us by collecting pledges and showing up with enthusiasm for our Annual Walk. This is our only fundraising event. Please consider being a Walker, or sponsoring a Walker - We need everyone's help. For more information, please call the office at (403) 264-4045.